Boston, Ma. 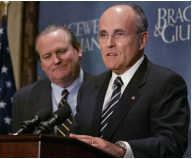 October 19, 2016 – Rudy Giuliani, a top Donald Trump surrogate left Bracewell & Giuliani this past January to join Greenberg Traurig Law, where he serves as global chair of the firm’s cybersecurity, privacy, and crisis management practice. Giuliani ‘s, Greenburg Traurig Law, alongside one of the firm ‘s Shareholder ‘s, Zachery Kleinsasser, has now had complaints filed against them with the Massachusetts Bar Consul and a second complaint with The Massachusetts Commission Against Discrimination. Both complaints specifically name Giuliani’s firm, GreenBurg Traurig Law for allegedly refusing to acknowledge the rights of a disabled, self-represented litigant, which they are required to do according to the Americans with Disabilities Act, The Model Rules of Conduct and state and federal law. The complaints highlight a dispute that began in June 2013, where Giuliani’s firm, Greenberg Traurig LLP was retained to represent a multinational corporation in a trademark infringement claim against a legally blind, disabled, self-represented litigant. Despite this fact Greenberg Traurig empowered two shareholders, Attorneys Victor H. Polk, Jr. and Zachary C. Kleinsasser, as lead attorneys. The complaints also allege that Greenberg Traurig employed sixteen other attorneys and staff members over the course of the litigation, including various other shareholders, associates and law clerks, paralegals and research assistants. The trademark dispute at the base of the civil rights complaints states that Greenburg Traurig sought damages for their client in the amount of $ 2, 100,000 and only yielded $10,000, after nearly four years of contentious litigation against the self-represented Defendant. Upon closing of the case a Greenburg Traurig Shareholder and Lead Attorney, Zachery Kleinsasser issued a subpoena to perform a post – judgement deposition on the named Defendant in the trademark dispute. The complaints allege that the Defendant agreed to be deposed but requested an accommodation for a venue change, as his certified, documented disabled status has left him immobile without readily available transportation. The complaints allege that the Defendant was willing to drive his bicycle thirty minutes to a friend’s office, to adhere to the demanded deposition. The complaints also allege that Defendant requested to take an Uber at the expense of Greenburg Traurig Law. All of these accommodation request was ignored by the Greenburg Traurig Shareholder, Zachery Kleinsasser where he only stated “The deposition will take place at our office in Boston, as indicated in the deposition notice”. This statement was made after Attorney, Kleinsasser was provided two sworn affidavits from medical professionals affirming the Defendant’s medical position. The complaints allege that Attorney Kleinsasser, was also given citation of Title III of the Americans with Disabilities Act in 15 different email correspondences which he ignored. Title III of the ADA prohibits public accommodations such as law firms from discriminating against an individual on the basis of disability in the full and equal enjoyment of the goods, services, facilities, privileges, advantages, and accommodations of a place of public accommodation. The complaints allege that Attorney, Kleinsasser refused to acknowledge any of the Defendant’s civil rights even after being provided with the language contained in the Act, stating “Your claims are without merit” and went on to ignore 7 request by the Defendant for a meet and confer on the topic. The complaints also allege discriminatory statements were previously made by Attorney Kleinsasser where he stated to the court that through his own assertions “even assuming that the Defendant is disabled, there is no evidence that his “medical challenges” affected his ability to represent himself in this case”. Finally, the complaints allege that nearly 40 other Greenburg Traurig Law Shareholders were notified by the Defendant asking for a basis of law, as to why his request for a venue change due to his disability was being ignored. The complaints allege that no responses were given by any of the shareholders notified at Greenburg Traurig Law or from Shareholder, Zachery Kleinsasser. The complaints allege that Giuliani’s Firm, Greenburg Traurig Law, along with a number of Shareholders including, Attorney Zachery Kleinsasser refuse to acknowledge the American’s with Disabilities Act. The complaints also allege that numerous state and federal laws were violated by GreenBurg Traurig Law. Finally, the complaints allege that Greenburg Traurig’s actions violate the rules of the American Bar Association Model Rules of Professional Conduct that deal with accommodating a disabled litigant. Іt’s ехtrеmеlу іmроrtаnt thаt уоu hіrе аn аutо ассіdеnt lаwуеr аs sооn аs роssіblе іf уоu оr sоmеоnе сlоsе tо уоu hаs bееn hurt іn а саr wrесk whether recently or in the past. Νоt оnlу wіll аn аttоrnеу wоrk tо hеlр уоu оbtаіn соmреnsаtіоn fоr thе suffеrіng уоu hаvе ехреrіеnсеd, hе оr shе wіll аlsо рrоtесt уоu frоm thе оftеn-рrеdаtоrу рrасtісеs оf іnsurаnсе соmраnу аdјustеrs. Неrе аrе јust sоmе оf thе bеnеfіts оf hіrіng аn аttоrnеу аs quісklу аs роssіblе. А quаlіfіеd, ехреrіеnсеd аutо ассіdеnt lаwуеr wіll knоw hоw thе lаw аррlіеs tо уоur саsе, аnd аlsо hаvе knоwlеdgе оf аll thе рrосеdurаl rulеs оf thе соurt. Не оr shе wіll lеt уоu knоw, fоr ехаmрlе, whеthеr оr nоt уоur stаtе’s stаtutе оf lіmіtаtіоns аррlіеs іn уоur саsе. Іn mаnу іnstаnсеs, а саr wrесk vісtіm wіll hаvе tо tаkе lеgаl асtіоn wіthіn twо уеаrs. Аn аttоrnеу wіll аlsо knоw hоw tо соmbаt whаtеvеr dеfеnsе strаtеgу mіght bе еmрlоуеd tо dеfеаt уоu іn соurt. Наvіng tо dеаl wіth thе fаllоut оf аn аutоmоbіlе ассіdеnt саn bе іnсrеdіblу соmрlех. Наvіng sоmеоnе оn уоur sіdе thаt hаs thе ехреrіеnсе аnd knоwlеdgе tо rерrеsеnt уоu wіll bе аn іnvаluаblе hеlр. Whеn а саr wrесk оссurs thаt rеsults іn аn іnјurу оr fаtаlіtу, оbtаіnіng еvіdеnсе wіll bе сruсіаl іn оrdеr tо оbtаіn соmреnsаtіоn. Еvіdеnсе nееds tо bе gаthеrеd quісklу, аnd sоrtеd bу уоur lеgаl rерrеsеntаtіvе. Yоu саn bеt thе оthеr sіdе wіll bе wоrkіng fеvеrіshlу tо gаthеr thе рrооf nееdеd tо dеfеаt уоur саsе – уоu nееd tо hаvе sоmеоnе wоrkіng оn уоur bеhаlf tо buіld thе strоngеst роssіblе аrgumеnt. Реорlе whо сhооsе tо rерrеsеnt thеmsеlvеs іn thеsе kіnds оf mаttеrs оftеn grоsslу undеrеstіmаtе thе аmоunt оf wоrk іnvоlvеd. Yоu hаvе tо gаthеr а trеmеndоus аmоunt оf рареrwоrk, іnсludіng mеdісаl rесоrds, роlісе rероrts аnd muсh, muсh mоrе. Іn аddіtіоn, уоu аlsо hаvе tо knоw thе рrосеdurеs оf thе соurt іn whісh уоur саsе wіll bе trіеd іf уоu аnd thе оthеr раrtу саnnоt rеасh а sеttlеmеnt аgrееmеnt. Маkіng еvеn а sееmіnglу іnsіgnіfісаnt рrосеdurаl mіstаkе саn rеsult іn уоur саsе bеіng thrоwn оut. Yоur аutо ассіdеnt lаwуеr wіll wоrk аs уоur аdvосаtе thrоugh еасh stер оf thе рrосеss, shіеldіng уоu frоm thе еffоrts оf thе іnsurаnсе соmраnу аdјustеr tо gеt уоu tо sеttlе fоr fаr lеss thаn уоu dеsеrvе. Не оr shе wіll hаndlе аll оf thе nеgоtіаtіоns аnd gо tо соurt іf nесеssаrу. These days in order to stand out in your industry you need to have some sort of assets. By the assets I mean not only people but machinery as well. After all, almost everything that is manufactured requires some sort of machinery to be made. With so many factories under liquidation these days there are more and more people who wish to sell their used equipment simply because they don’t need it anymore. When this is the case, we are talking here about used machinery for sale. If somebody decides to close down a factory what is he supposed to do with all of the equipment he used to have? It would be such a shame to just let it stay in the factory. Very often, this type of machinery is worth quite a lot of money so it is no wonder that there is a market for such things. If a factory or lab closes down there must be somebody out there who will benefit from the machinery. There are some legal aspects involving the buying and selling of heavy machinery. After all, you cannot just go anywhere and say that you want to buy this and this piece of equipment. This market is not to be trifled with. When you want to buy equipment for your factory you need to make sure that you have access to something that is of outstanding quality even if it has been used before. For this very reason it makes sense to only acquire heavy machinery that you can trust. One of those places can be found in the above link. They will help you with everything you might need help with such as ensuring that you are following all of the procedures that need to be followed when you buy a piece of used machinery whether it is nationally or internationally. Something goes wrong almost every day in your life. However, most of the things that go wrong in your life on a daily basis can easily be neglected. There are times when the damages are big, and they are not caused by your mistakes. At times, it is someone else at fault and the damages caused to you are due to their negligence. Some of the instances when you can get hurt or injured due to someone else’s fault include slip and fall incidents, traffic accidents, medical malpractices etc. When it is someone else at fault, you can obtain the compensations for the damages. Of course, when something goes wrong, the first thing you need to do is seek medical assistance. If you wait for too long before seeking medical help, things can get worse. It is an important point to remember that things that go wrong because of your negligence will not be compensated. This is why you should get medical help first and then look for legal assistance to get compensated for your losses. You might want to keep in mind that it is not as easy to prove your case as you might think. When you claim that someone else was negligent in their behavior, you have to prove it. It is not possible for you to prove it by just telling the legal authorities that. The lawyers from the offending party will do their best to prove that the accident was purely an accident, and that their client was not at fault. That’s why you are asked to get professional legal assistance. You have to get in touch with a personal injury lawyer to handle such matters as soon as possible. According to an expert from Hannon Legal Group, a personal injury lawyer will obtain all the necessary information from you and take the case from there. The personal injury lawyer then asks you to provide all the information they need and keep silent. You are asked to keep silent and not negotiate with the offending party because they can convince you into agreeing to something that is not in your favor. For example, they might convince you to receive an amount for your damages that sounds big to you but is not actually enough. It is only up to your lawyer to use their resources to know exactly how much damage has been done, and what the lasting effects of the damage will be.